Colombia’s interior minister reopened negotiations with indigenous representatives in the Cauca province after native protesters in the neighboring Valle del Cauca suspended talks. 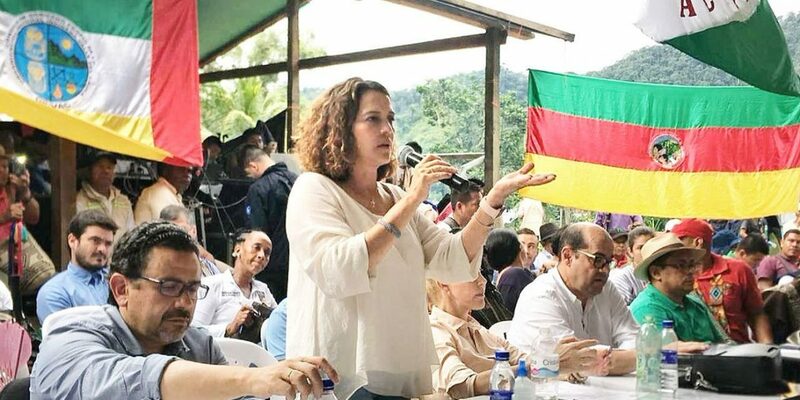 Minister Nancy Patricia Gutierrez suspended talks with the CRIC on Thursday after blaming the local indigenous people of having kidnapped a soldier who was apprehended by indigenous guards, allegedly for entering their territory armed. The decision to end the talks triggered national indigenous organization ONIC to call for a national “minga” and peoples from across Colombia began organizing protest meetings and blocking roads. The minister then went to Valle del Cauca to talk to the ONIC, but they suspended talks on Sunday after the government refused to stop stigmatizing the protests and threatening to take indigenous leaders to court. Having been left with no other option, the minister said Monday that she would resume talks with the CRIC. “Yes. This Tuesday we return to Cauca to restart the dialogues… because the government keeps all the channels of conversation open,” said Gutierrez four days after ending the talks and triggering national protests. “Let the government come and sit down in order to talk,” CRIC representative Lejandrina Pastor told press, but indicated that this time Gutierrez better come with concessions. “What we have seen is that the government doesn’t lacks will and it’s because of this that… we see that the afrocolombians and peasants are joining,” Pastor said. According to Gutierrez, this time she will be bringing proposals to curb chronic government neglect and give indigenous peoples access to land, education and healthcare. The director of National Planning, Gloria Alonso, has been working all day to bring them a proposal that has to do with productive projects, with a feasible amount of land and additional issues that have to do with education and health. The alleged government proposals would be the first after three weeks of protests and growing concerns about food and medicine shortages caused by the indigenous’ road blocks. The ONIC, meanwhile, urged international organizations to be on alert amid fears that the military could intervene and violently break up the protests.